Test Engineers can now efficiently test voice quality with a common platform and common software, thereby avoiding purchasing dedicated software and equipment for various technologies. The test tools provide the means of sending and receiving speech signals through various network interfaces. GL's Voice Quality Testing (VQT) software supports the next-generation voice quality testing standard for fixed, mobile and IP-based networks using POLQA (ITU-T P.863), PESQ (ITU-T P.862), PESQ LQ / LQO (P.862.1), PESQ WB (P.862.2), PAMS (ITU-T P.800), and PSQM/PSQM+ (ITU-T P.861). PESQ provides an objective measurement of subjective listening tests on telephony systems. PAMS predicts overall subjective listening quality (a human's perception of quality) without requiring actual subjective testing (a very expensive and time-consuming process). PSQM predicts subjective quality of speech codecs without requiring subjective testing. POLQA, Perceptual Objective Listening Quality Analysis, is the successor of PESQ (ITU-T P.862) analysis and the next generation voice quality testing standard for fixed, mobile and IP-based networks. POLQA, based on ITU standard, ITU-T P.863, supports the latest HD-quality speech coding and network transport technology, with higher accuracy for 3G, 4G/LTE and VoIP networks. 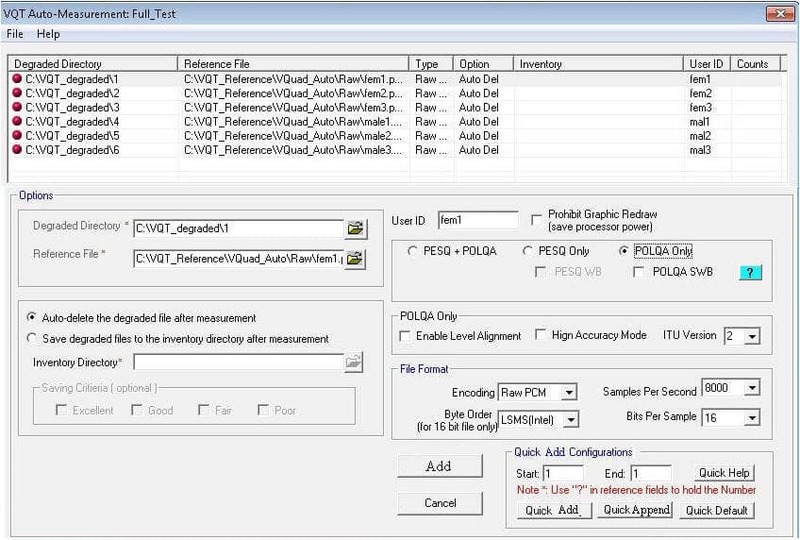 The VQT supports analysis using POLQA algorithm for NB (8000 sampling), WB (16000 sampling), and SWB (Super Wideband) (48000 sampling) in both manual and automated testing. POLQA® is a registered trademark of OPTICOM. GL is one of the Test & Measurement manufacturers that has adopted POLQA/P.863 in its Voice Quality Test solution, by obtaining the essential rights to use POLQA® standard, and hereby acknowledge that the images or text references to POLQA used in this document originally copyrights with Opticom. The results of the VQT algorithms, POLQA and PESQ LQ/LQO/WB, are displayed both in tabular format as well as graphically. 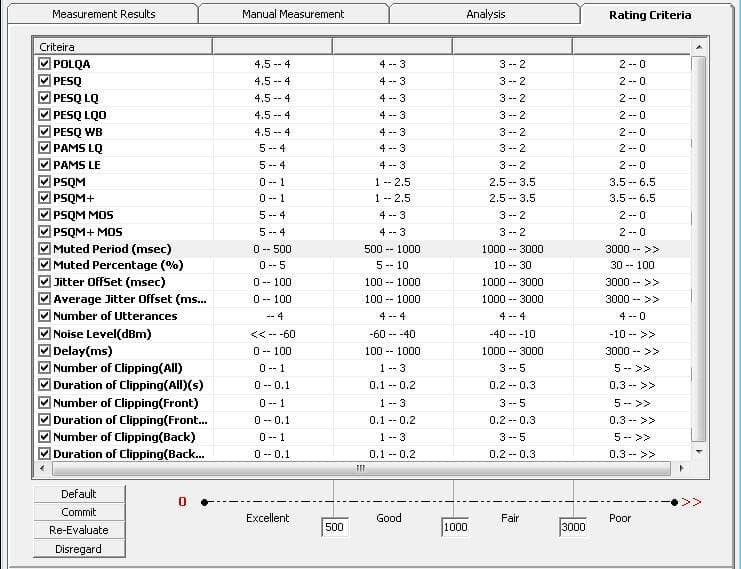 Additional analytical results are displayed as part of the assessment such as POLQA MOS, E-Model, Signal Level, SNR, jitter, clipping, noise level, and delay (end to end as well as per speech utterance). All results are saved to file and database for post processing viewing along with sophisticated searching on the results within the VQT application and using the WebViewer™ (remote and local access). The VQT software can work either independently, in conjunction with VQuad™ - Dual UTA HD, or in conjunction with VQuad™ Probe. The VQuad™ Probe HD(combines with VQuad™-Dual UTA - PC into one single box) provides multiple interfaces for connecting to any communication device on a network using an efficient, portable, single box solution. The VQuad™ Probe HD can work with variety of networks, including Wireless (Bluetooth®, Wi-fi, 3G, 4G, LTE, PTT), VoIP, Analog, and TDM, practically allowing any end-point interfaces to be tested for voice, data, and video quality. Various associated applications (Voice Quality, Video Quality, Data tests, Echo and Delay tests, Fax tests, VBA) works with VQuad™ Probe HD to provide "end-to-end assessment" with additional test and measuring capabilities. GL's NetTestVQT app (rooted Android devices), supports both manual and automated testing of Voice Quality within the network. All recorded voice files, whether recorded at the NetTest VQT app (on the Android phone) or recorded at the VQuad™ system, are automatically transferred to the Central VQT system for analysis. All results associated with the VQT analysis as well as the call control events are transferred to the Central Database and accessed using GL’s web-based WebViewer™. Third party Goldwave software (SA048) is required for playback, viewing, and analysis of audio from within VQT software. Measuring the effect of Packet Jitter in VoIP Network. Provides POLQA and PESQ Mean Opinion Score (MOS) results. Tabular as well as Graphical Results. Playback and display of audio files from within VQT using Goldwave software. Complete automatic logging of all results (both file and database) with the ability to import log back into VQT. Real-time mapping (most countries supported) of results when optional GPS is used in conjunction with VQuad™. The GL VQT may also be executed in Auto Mode. This allows the GL VQT to reside anywhere in a network and monitor multiple user-specified network drives/directories for voice files. GL VQT automatically performs the voice quality algorithms on these recorded voice files and displays the results. Multiple GL VQT Auto-Measurement sessions may be configured, each session with a unique set of requirements and a unique reference voice file. In addition, the user may specify voice files to be saved based on the rating criteria (i.e. if VQT is fair or poor, save the degraded voice file). For manual mode measurement, users can configure a single degraded and reference voice files. VQT automatically performs the voice quality algorithms for the voice files and the current measurement parameters are displayed. Manual mode is limited to single voice file analysis at a time, which are configured from the specified network drives/directories. Suitable for 3G and 4G networks, VoIP networks and NGN networks delivering HD- quality voice services such as "wideband" and "super-wideband" telephone calls, 7 kHz and 14 kHz frequency range. Suitable for G.711 A law and u law, and low bandwidth 300 to 3400 Hz voice bandwidth. Also supports WB (7kHz frequency range) using PESQ ITU-T P.862.2. Perceptual Objective Listening Quality Analysis (POLQA), the successor of PESQ (ITU-T P.862) analysis, is the next generation voice quality testing standard for fixed, mobile and IP-based networks. Based on ITU standard ITU-T P.863, POLQA supports the latest HD-quality speech coding, and higher-bandwidth audio signals suitable for Fixed, Wireless (3G, 4G/LTE) and VoIP networks. The POLQA algorithm handles the higher bandwidth audio signals. POLQA supports measurements in the narrow band (NB, 300-3400 Hz), and significant new capabilities for wideband (WB, 100 - 7000 Hz), and super-wideband (SWB, 50-14000 Hz), commonly found in VoIP and next generation mobile networks. 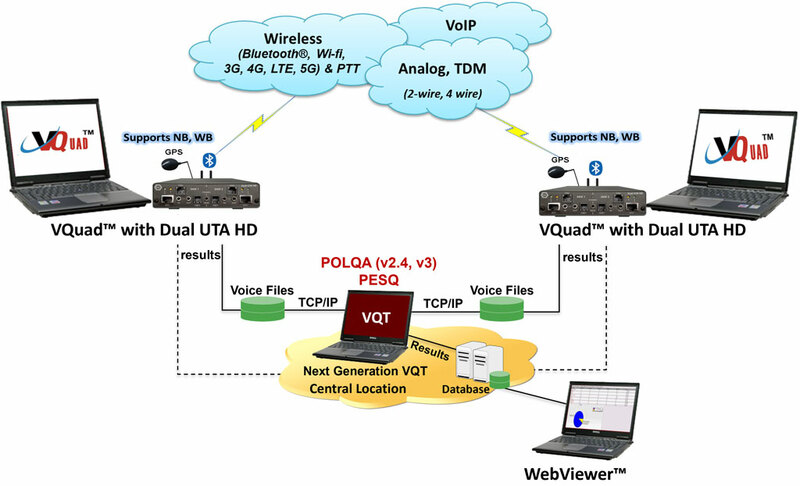 GL's enhanced VQuad™ and stand-alone Voice Quality Testing (VQT) software, both support the next-generation voice quality testing standard for fixed, mobile and IP-based networks using POLQA (ITU-T P.863). As part of the POLQA analysis, results include POLQA MOS, E-Model, Signal Level, Noise Level, and Jitter. Automated voice quality testing using POLQA can be performed through scripting in VQuad™. The VQT also supports other international standard voice quality test methods including PESQ (ITU-T P.862), PESQ LQ / LQO (P.862.1), PESQ WB (P.862.2), PAMS (ITU-T P.800), and PSQM/PSQM+ (ITU-T P.861). The VQT software can work either independently, in conjunction with VQuad™ - Dual UTA HD, or in conjunction with VQuad™ Probe HD. Using GL’s VQuad™ application along with the Dual UTA HD, or all-in-one VQuad™ Probe HD, voice, video, and data tests are supported for practically any end-point (customer experience) interfaces. The VQuad™ Probe HD (combines with VQuad™-Dual UTA HD - PC into one single box) provides multiple interfaces for connecting to any communication device on a network using an efficient, portable, single box solution. The VQuad™ Probe HD can work with variety of networks, including Wireless (Bluetooth®, Wi-fi, 3G, 4G, LTE, PTT), VoIP, Analog, and TDM, practically allowing any end-point interfaces to be tested for voice, data, and video quality. Various associated applications (Voice Quality, Video Quality, Data tests, Echo and Delay tests, Fax tests, VBA) works with VQuad™ Probe HD to provide "end-to-end assessment" with additional test and measuring capabilities. All the applications work in conjunction with the VQuad™ for automatically and remotely analysing the captured data and sending the test results to the central database. You can query results or control the tests remotely using web-based WebViewer™. To split the signals into equidistant pairs of frames and to calculate a delay for each frame pair. Whenever possible, the matching counterparts of the degraded signal sections are searched for in the reference signal and not vice versa. Stepwise refinement of the delay per frame to avoid long search ranges (long search ranges require high computing power and are critical in combination with time scaled input signals). The sample rate ratio detection is required to compensate for perceptually irrelevant differences in the play-out speed of both, the reference and the degraded signal. The detection of this effect as implemented in the ITU-T P.863 algorithm is based on the delay per frame vector and the detected active sections of the speech signals, as determined by the temporal alignment. If the detected sample rate ratio is larger than 0.01, the signal with the highest sample rate will be down sampled and the entire processing starts from the beginning. This happens at most one time to avoid excessive looping in case of signals for which the sample rate ratio cannot be determined in a reliable manner. Even if the sample rate determination cannot be made with perfect accuracy, e.g., in case of signals with additional variable delay, the detected sample rate ratio is still accurate enough to bring the signals back to the safe operating range of the temporal alignment. The ITU-T P.863 algorithm is designed to take into account the impact of the play back level for the perceived quality prediction in super wideband mode; the playback level is calculated relative to a nominal level of –26 dBov, which represents 73 dB(A) SPL in dichotic presentation. In narrowband operational mode the ITU-T P.863 algorithm is designed to determine the listening speech quality at a constant listening level of 79 dB(A) SPL. The ITU-T P.863 algorithm can operate in two modes, narrowband mode, and super wideband mode. In the narrowband mode, both the reference and degraded signals are pre-filtered with an IRS receive filter representing a listening situation in which subjects judge the quality of the speech signals over an IRS receive handset in monotic mode or over an IRS receive headset in monotic mode. In the super wideband mode, both the reference and degraded signals are not filtered, representing a listening situation in which subjects judge the quality of the speech signals over a diffuse field equalized headset in dichotic mode. narrow-band mode for listening over loosely coupled IRS type handsets. In the super wideband mode the impact of play back level is modeled and the default calibration factor (C) of 2.8 has to be used in combination with the standard –26 dBov scaling for play back levels of 73 dB(A) SPL (dichotic). Play back levels down to 53 dB(A) SPL and up to 78 dB(A) SPL may be used and MOS-LQO scores should be reported in the format MOS-LQOsw (dB level). In narrowband mode only the play back level of 79dB(A) SPL (monotic) is supported. Narrowband mode MOS scores are referred to as MOS-LQO. The maximum ITU-T P.863 MOS-LQO score is 4.5 in narrow-band while in super wideband mode this point lies at 4.75. Under some circumstances, when the reference signal contains noise or when the voice timbre is distorted, a transparent chain will not provide the maximum MOS score of 4.5 in narrowband mode or 4.75 in super wideband mode. POLQA also provides a mapping of the MOS-LQO score to the scale used by G.107 (e-model). The resulting parameter is equivalent to an Ie – Value. Many people also refer to it as an R-factor. The scale ranges from 0 (bad) up to 100 (best). All values below 60 indicate unacceptable quality. Especially all analog equipment modifies the level of the speech signal. A high attenuation generally leads to a worse perception of voice. In contrast to PESQ, POLQA does weight this as degradation of the signal. Knowing the value of the attenuation is also important for optimizing the overall system design. Attention should be paid to signals which show either a negative attenuation, or attenuations larger than approximately 10dB. In the first case, the signal was amplified instead of attenuated. This may eventually lead to level clipping during the transmission. In the second case, the quantization noise may become an important source of degradation, if low level analog signals are converted to the digital domain and are subsequently amplified in the digital domain. Depending on the test setup, both cases may be ok and intended, but this has to be decided on a case by case basis. In order to calculate the attenuation, POLQA computes P.56 like active speech levels of the reference as well as the degraded signal in dB. The level of the degraded signal minus the level of the reference signal is then used as the attenuation. In transmission systems it is frequently important to know the exact levels of the signals. Especially for VoIP systems and voice activity detection (VAD) it becomes also important to know the signal level during the silent intervals as well as during active speech. It is important, that the received background noise does not exceed a certain limit. Levels can be measured in dB if you want to relate the level directly to a sound pressure or electrical level, or as loudness levels. POLQA calculates the SNR for the reference and the degraded signal independently. The noise as well as the signal level is calculated by the VAD which POLQA uses for the temporal alignment. ASR is calculated by POLQA based on the information calculated by the Voice Activity Detection (VAD) which is part of the temporal alignment. The ASR defines the ratio between active speech and the overall signal length. GL's Voice Quality Testing (VQT) software, supports the next-generation voice quality testing standard for fixed, mobile and IP-based networks using POLQA (ITU-T P.863), PESQ (ITU-T P.862), PESQ LQ / LQO (P.862.1), and PESQ WB (P.862.2). The VQT can be used with any GL call capture and analysis application such as T1 E1 CCA, PacketScan™, VQuad™ and other products that can record or generate voice files over live network. The GL VQT software automatically analyzes the degraded voice files while sending the results to a central database. The results associated with the POLQA analysis include POLQA MOS, E-Model, Signal Level, Noise Level, and Jitter. As an additional feature, POLQA is added directly to VQuad™ software with support for automated testing within the VQuad™ script. In this scenario, the degraded voice files remain at the VQuad™ node for analysis and display within the VQuad™ software. For more details, please visit VQuad webpage. PESQ provides an objective measure that predicts the results of subjective listening tests on telephony systems. To measure speech quality, PESQ uses a sensory model to compare the original, unprocessed signal with the degraded version at the output of the communications system. The result of comparing the reference and degraded signals is a quality score. This score is analogous to the subjective Mean Opinion Score (MOS) measured using panel tests according to ITU-T P.800. PESQ incorporates many new developments that distinguish it from earlier models for assessing codecs. These innovations allow PESQ to be used with confidence to assess end-to-end speech quality as well as the effect of such individual elements as codecs. In addition to the standard PESQ score, the GL VQT also provides the PESQ LQ and LQO (P.862.1) score. These revised scores exhibits better correlation to subjective listening quality test scores. Real-time mapping of results with GPS option used in conjunction with VQuad™. The processing carried out by the PESQ algorithm includes the following stages. In order to compare the signals, the reference speech signal and the degraded signal should be at the same, constant power level. This is necessary because the reference signal does not have to be at a defined level and because the gain of the system under test is unknown before testing. PESQ assumes that the subjective listening level is a constant 79dB SPL at the ear reference point [ITU-T P.830, section 8.1.2]. A gain is applied to both the reference and degraded signals to bring them to this level. Analog connections often introduce some degree of filtering. For example, PESQ models the receive path of the telephone handset using an input filter. This takes account of the effect of the electrical and acoustic components of the handset. The filter used is similar to the standard "modified IRS receive characteristic" [ITU-T P.830]. It is generally accepted that this has less effect on quality than coding distortions do. PESQ compensates for any filtering that has taken place in the network. The system under test may include a delay, which may be variable. In order to compare the reference and degraded signals, they need to be lined up with each other. PESQ applies voice activity detection to the signals to identify those parts of the signal that are speech, ignoring noise. The PESQ time offset measurements do not take account of the delay of the test equipment generating or recording the signal. This means that a time offset reported by PESQ on a file collected will be dependent upon the way in which the test process is executed. First, PESQ aligns the overall speech signals (utterances). An utterance is a continuous speech burst identified by the voice activity detector that does not contain pauses longer than a pre-determined threshold (200ms). This process detects delay over major sections of the degraded signal compared to the reference signal. Second, PESQ aligns overlapping sections of the speech (frames). This process detects delay that is variable over the length of an utterance, as this can be significant in packet-based networks. The third stage does not occur immediately after the second stage, but is performed after the auditory transform has been calculated. The third stage realigns "bad intervals" (sections of the speech with very large disturbance), and improves the model's accuracy with a small number of files where delay changes are not correctly identified by the initial time alignment process. In order to compare the reference and degraded signals, taking account of how a listener would have heard them, each is passed through an auditory transform that mimics certain key properties of human hearing. This gives a representation in time and frequency of the perceived loudness of the signal, known as the sensation surface. Part of the auditory transformation equalizes certain processes that have little subjective effect. First, the transfer function of the system is estimated, and is used to equalize the reference to the degraded in the auditory transform domain. This takes account of filtering in analogue components of the network such as telephone handsets. Second, the frame-by-frame amplitude gain of the system is estimated and used to equalize the auditory transform of degraded file to the reference. In both cases the equalization is partial - large amounts of filtering or gain variation are not cancelled, and therefore result in errors being measured. The difference between the sensation surfaces for the reference and degraded files is known as the error surface; this shows any audible differences introduced by the system under test. The error surface is analyzed by a process that takes account of the effect that small distortions in a signal are inaudible in the presence of loud signals (masking). This analysis gives two error parameters that summarize the amount of each type of audible error. Finally, the error parameters are converted to a quality score, which is a linear combination of the average symmetric disturbance value and the average asymmetric disturbance value. PESQ returns a quality score, known as PESQ score, which conforms to ITU-T P.862. PESQ score lies on a scale from -0.5 to 4.5, though in most cases it is between 1 and 4.5. PESQ score correlates with subjective quality scores. However the PESQ score tends to be optimistic for poor quality speech and pessimistic for good quality speech. Alternative mappings for PESQ score have been developed which do exhibit a better correlation to subjective test scores. These are referred to as the PESQ-LQ and PESQ-LQO scores. PESQ-LQ scores are closer to the listening quality subjective opinion scale, which is standard in the industry and is defined in ITU-T P.800. Listening quality scores lie between 1 and 5. PESQ-LQ score lie between 1.0 and 4.5. This is because 4.5 is usually the maximum obtained in a subjective test. The score gives a measure of customers' perception of quality. The highest score, 4.5, means that no distortion is measured. As the amount of distortion increases the quality falls. The aim of a separate recommendation ITU-T P.862.1 is to provide a single mapping from raw P.862 score to the Listening Quality Objective Mean Opinion Score (LQO-MOS). This latest ITU standard improves on the original PESQ (P.862) by correlating better to subjective test results. Based on simulations and real measurements, the table below represents the results of a number of typical networks and codecs with no errors or packet loss. In addition, it gives the scores that can be expected in some mobile network conditions where errors are significant. The GL VQT software automatically analyzes the degraded voice files while sending the results to the central database. The VQT analysis results include MOS, E-Model, SNR, Signal Level, Noise Level, Clipping, Delay, and Jitter. Jitter data is obtained from the time alignment process. The utterance-by-utterance offset must be determined accurately to get a speech quality measure. Jitter is the variation in time offset between reference and degraded utterances. The GL VQT reports utterance offset by providing a minimum/maximum and standard deviation value. These three are measures of jitter in the speech as delivered to the listener. GL also reports the average offset. Performance Examiner provides a number of diagnostic outputs that relate to the use of muting algorithms and discontinuous transmission. These outputs are generated by comparing the degraded signal to the reference signal. Muting of a signal typically occurs when an error concealment algorithm at a receiver has insufficient information to replace missing or corrupted data. The muting estimate is provided in terms of the proportion of signal frames that have been muted by the system under test. Discontinuous transmission (DTX) schemes aim to increase transmission efficiency by ceasing transmission during periods of talker inactivity. Temporal clipping occurs when the voice activity detection (VAD) algorithm in a DTX system misclassifies part of a speech utterance as noise, and replaces it with comfort noise at the receiver. Front-end clipping refers to the case where the start of an utterance has been clipped. Back-end clipping refers the case where the end of an utterance has been clipped. Hangover is a term applied to the period after the end of an utterance when a discontinuous transmission scheme continues to transmit as normal, rather than generating comfort noise. Speech Level Gain (dB) Speech Level Gain of the system under test. Calculated: (ASL of degraded signal) minus (ASL of reference signal). Noise Level Gain (dB) Gain calculated for noise in silent periods. Calculated as (MNL of degraded signal) minus (MNL of reference signal). May differ from the system gain if noise is added or suppressed. A PESQ/PESQ LQ/PESQ LQO score is available on a per utterance basis. Each sample is broken into distinctive utterances; which GL provides an ITU score for each of the utterances. For example, front end clipping, which would only affect the 1st utterance, could cause the overall scores to be lower than expected. PESQ/Utterance will indicate this cause. The delay per utterance results are acquired by comparing the beginning of each utterance in the reference file to the beginning of each utterance in the degraded file. This comparison takes place for each utterance in the reference and degraded files. The user may configure a Rating Criteria for all VQT algorithms as well as the additional analytical results. The rating criteria may be configured for Excellent, Good, Fair, and Poor and the results of the rating criteria may be saved to file for post processing viewing. Thus, the user may view only Fair and Poor results if desired. Full statistics are also available that include all measurement results as well as Rating Criteria results. VQT system also provides algorithm, rating, and graphical statistics. The tabular statistics includes Min, Max and Average measurements for the complete VQT system results including POLQA and PESQ analysis results (Jitter, Clipping, Speech/Noise level, and more). Global Rating History (24 hour) - displays the number of Excellent/Good/Fair/Poor results calculated in past 24 hours. Global Score History (24 hour) - shows the PESQ/POLQA scores that are calculated in past 24 hours. Rating Statistics per Instance - shows graph statistics for each instance. GL's WebViewer™ provides the method to display and access, in real time, the entire VQuad™/VQT network including all individual VQuad™ Probe HD as well as the central location. Current status of the entire test is displayed along with customized user statistics and results of the active tests. The results/events associated with the VQuad™ and the VQT analysis is sent to the central database and can be queried using the GL WebViewer™ (web browser). Outputs of the query can be displayed in tabular or graphical format while also output to Excel® or Text. Results can also be displayed in Google Maps (GPS connectivity is required). 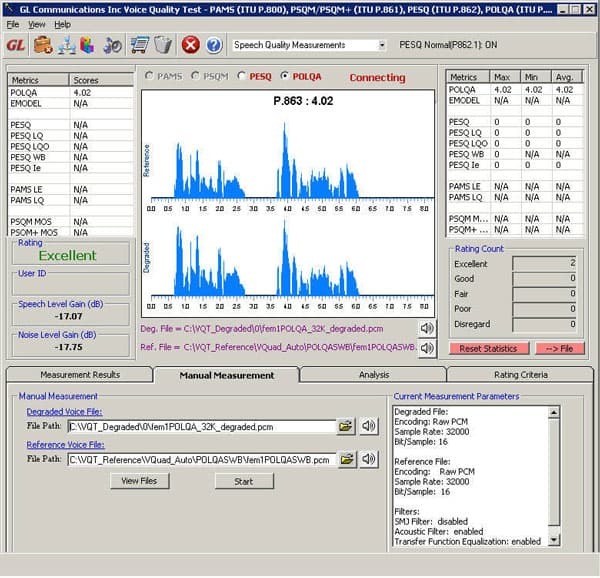 The POLQA analysis results sent to central database system, which can be queried over web interface includes Degraded Filename, Rating, POLQA Score, EModel (R-factor), Speech Level Gain (dBv), Noise Level Gain (dBv), Jitter Ave (ms), Jitter Min (ms), Jitter Max (ms), Active Speech Ratio – Ref (%), Active Speech Ratio – Deg (%),Number of Utterance, Delay Ave (ms), Delay Min (ms), and Delay Max (ms). For details, visit www.gl.com/vqtwebviewerdemo.html webpage. The VQT Command Line Interface (CLI) is designed to remotely access various application functionalities and thus controlling VQT nodes located at various destinations. 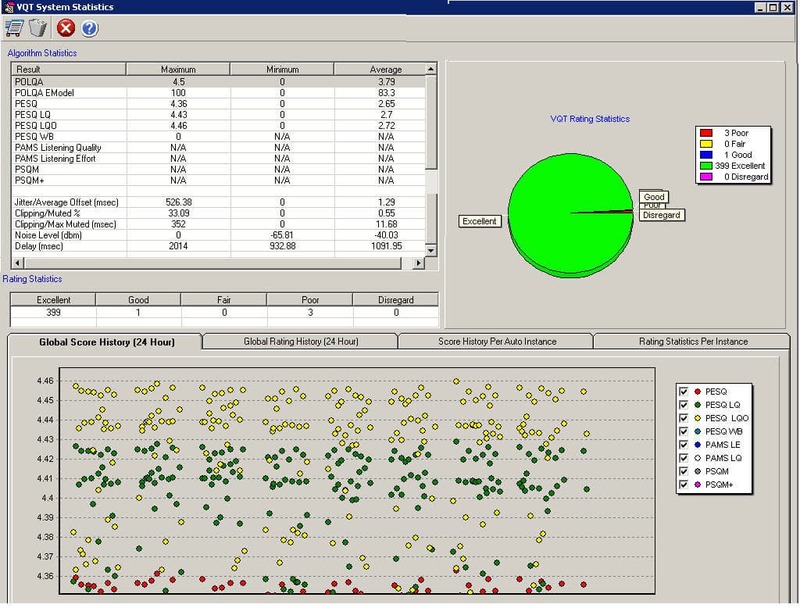 The supporting commands helps the VQT users to run the application installed on remote PC, get the connection status, run the analysis, load Auto Measurement configuration, start/stop Auto Measurement, save events captured to file, transfer the events captured to client, get any file from server or even get latest log, and other operations. The VQT CLI is supported on Windows® and Linux systems. GL has developed Windows® and Linux APIs for VQuad™ and VQT. Customers can now build custom, faster and cheaper applications using the features already available with GL applications. All important functionalities required to control VQuad™ and VQT remotely are available through APIs to ease the most complex application development activities. The VQT API environment provides two-way traffic to the VQT server, ability to control the VQT server remotely and provides for instant feedback of VQT client actions. 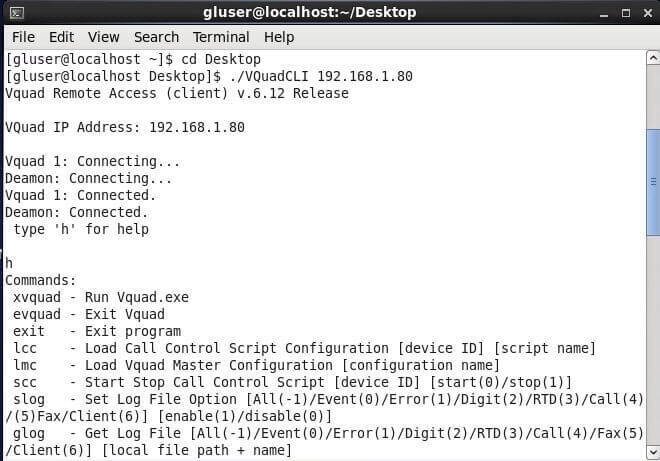 Connect/disconnect the client applications with a VQuad™ Server and GL Listener.